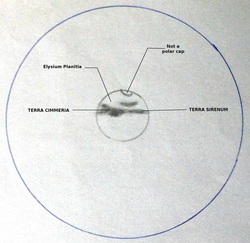 This image shows two dark regions that appears as a single dark band in the sketch. 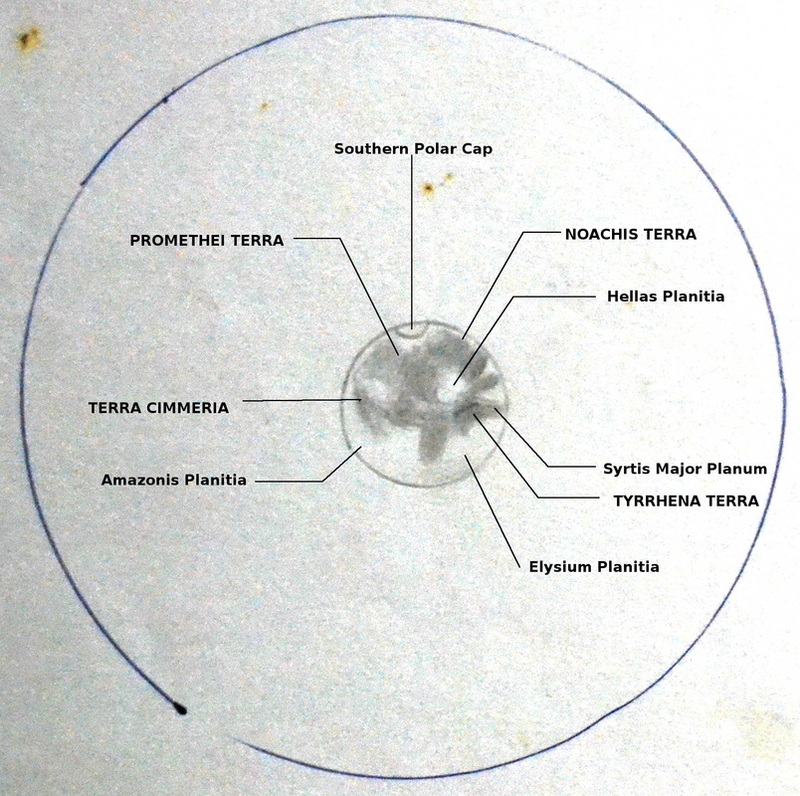 The regions are the Terra Sirenum and Terra Cimmeria. 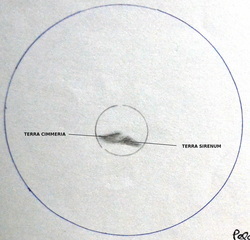 Only the lower polar cap is visible, although the view from the telescope made it appear as though both poles were visible. It is possible that the surface reflectivity on Mars may result to a white image along the disc. 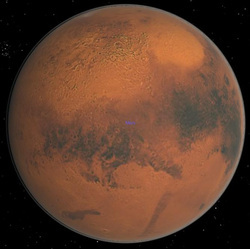 (at 96x) Mars in aquarius field. 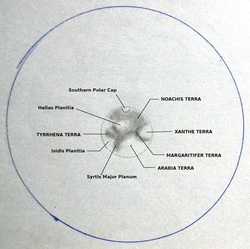 Polar Region very clearly shown. 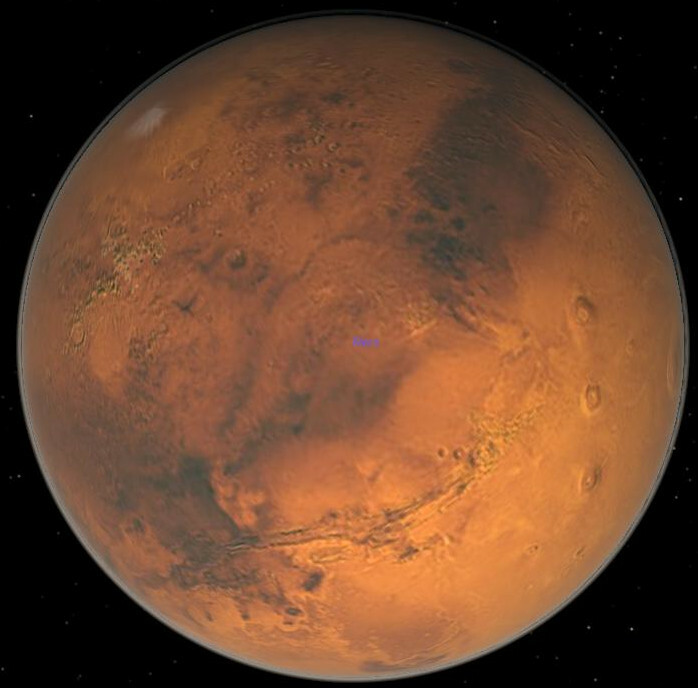 Mars looks bright yellow. A clearing can be seen in the middle with dark markings inside. (at 300x) There is a big blemish in the middle of a clearing. 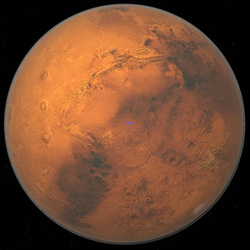 Mars does not look orange. Occasional clouds but sky is very transparent. Moon is past the 1st quarter phase and waxing. Moon is only a few degrees away in Sagittarius. Lower and upper positions of the hole seem darker. 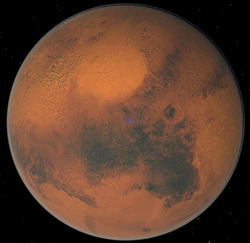 The image comparison cannot identify with the darker areas, however the area revealed at the center is possibly the Solis Planum and Valles Marineris region. Mars still big and shows lots of features. Polar ice cap visible at lower left of image. This was a lucky observing run. Clouds quickly covered everything as soon as I arrived in Taytay. 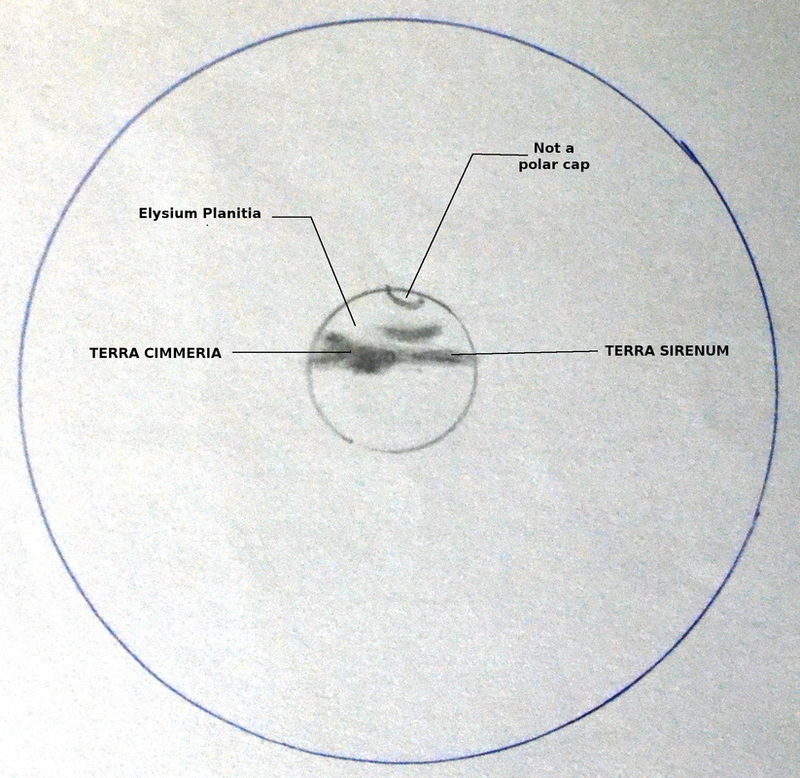 The image comparison shows that the lower left area of the sketch is not a polar cap but could have been a cloud or area of martian surface with a high albedo. 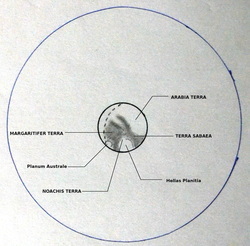 The sketch contains the Schiaparelli Region which holds the vast Arabia Terra (left blank area of sketch), the Terra Sabarea, Terra Meridiani and Margaritifer Terra. 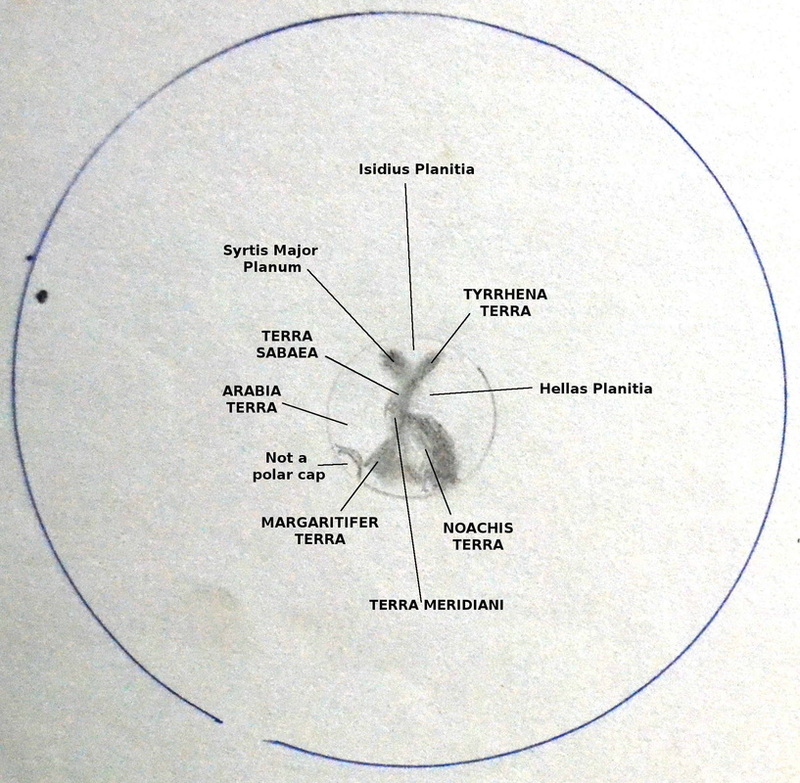 On the right of the sketch is the Hellas Planitia Region. 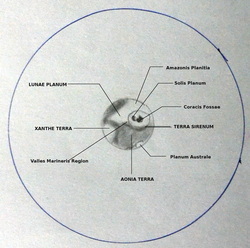 The bisecting dark areas on the Hesperia Planum Region shows the Syrtis Major Planum (bisecting to the upper left of the sketch) and the Tyrrhena Terra. Cloudy, moonless. 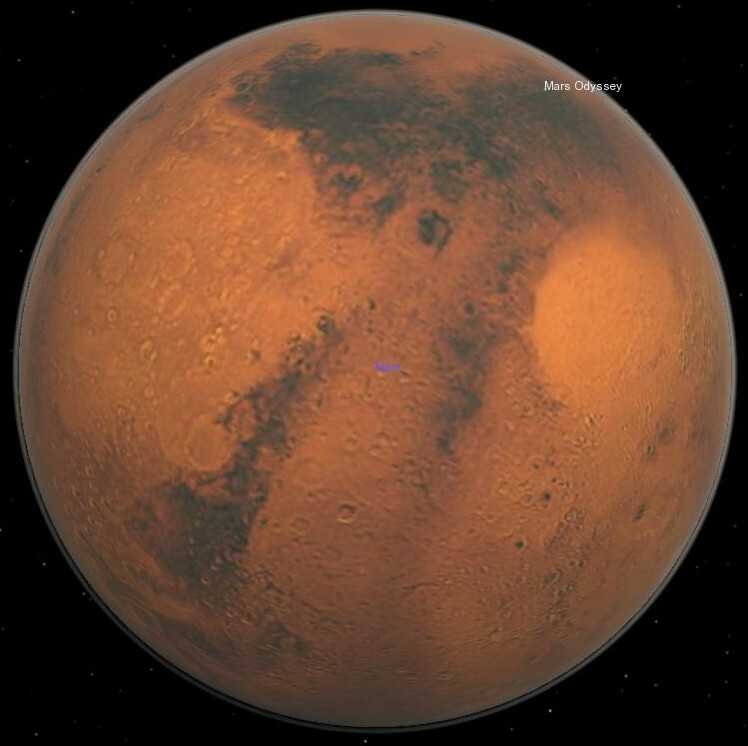 Mars noticeably getting smaller. 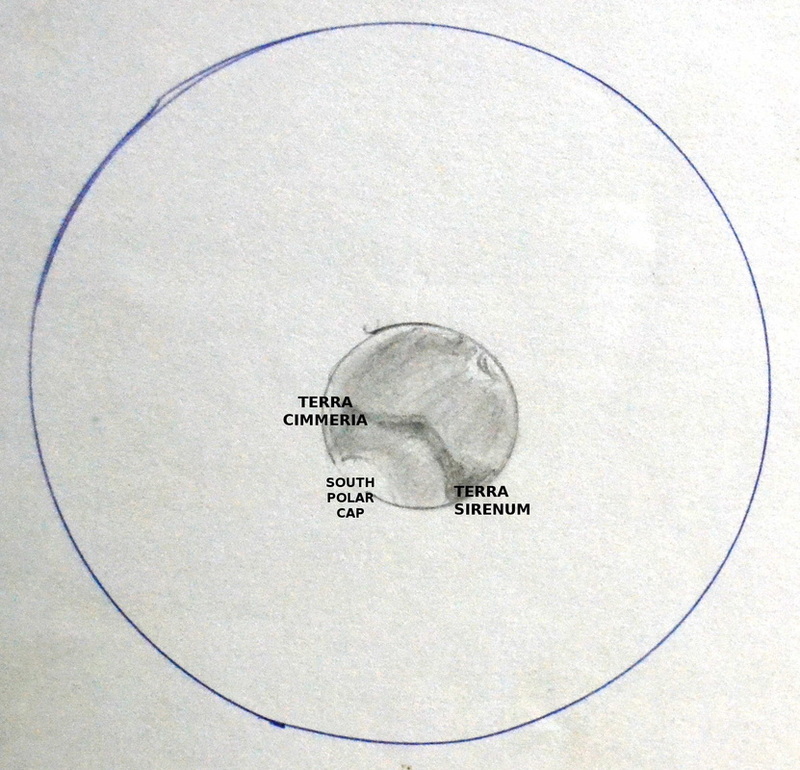 Martian features seen in this sketch and image include the Schiaparelli Region, and the Hellas Planitia Region. 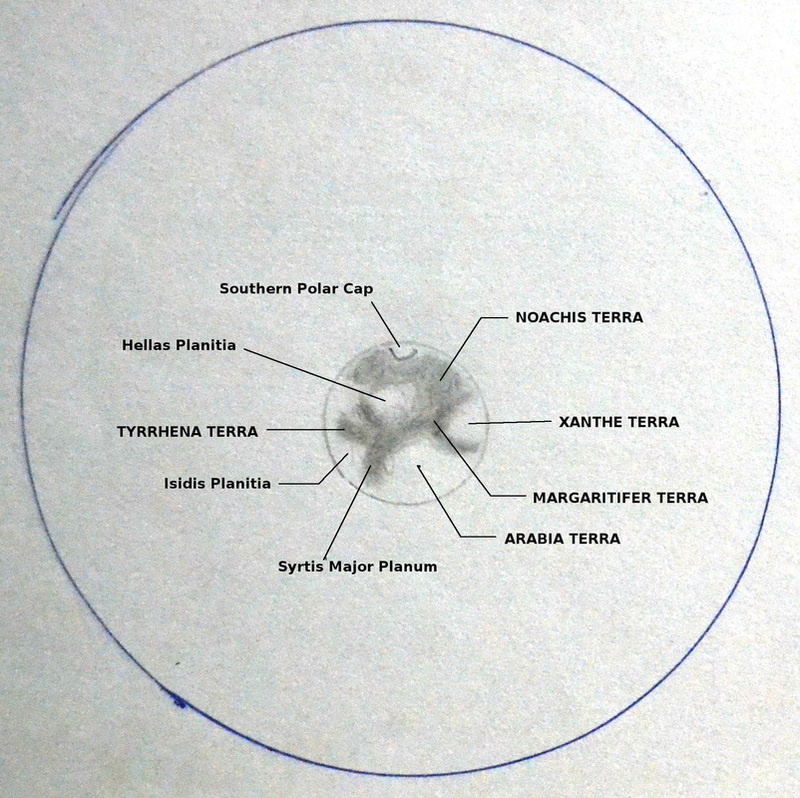 The Noachis Terra appears relatively darker in the sketch than in the image. Somewhat hazy with lights from the nearby basketball court open. 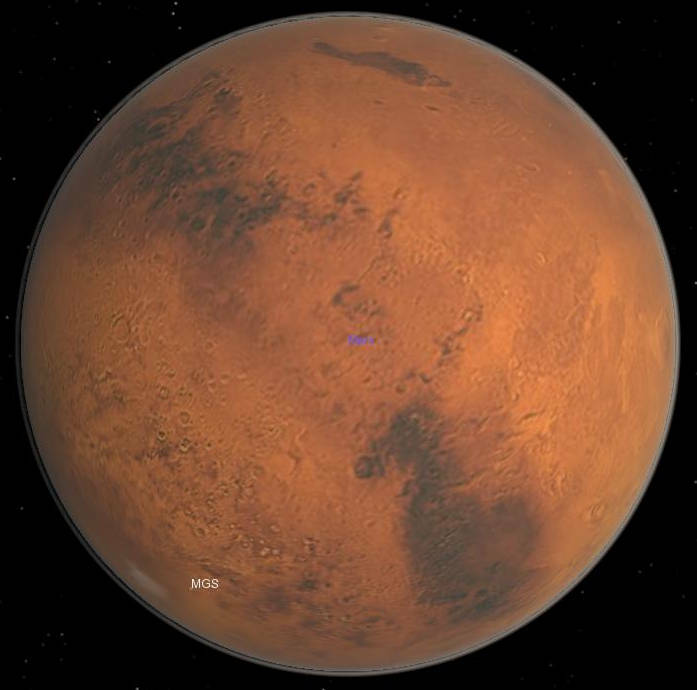 Mars getting smaller but still shows a lot of details. 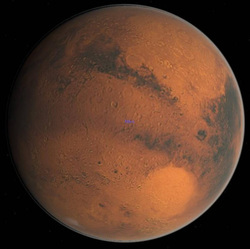 Mars still in Aquarius. 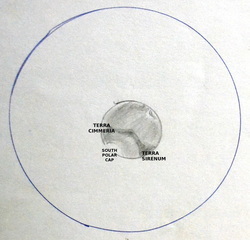 Martian features seen in this sketch and image include the Schiaparelli Region (lower right), and the Hellas Planitia Region (central top-left), and the Hesperia Planum Region (lower center). 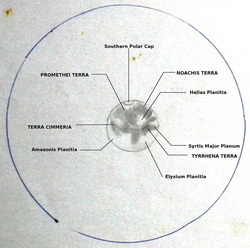 Emerging in the lower left is the Olympus Mons Region. 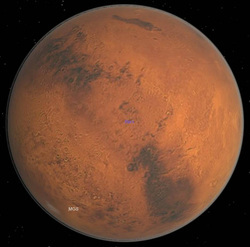 Mars getting smaller and smaller. When this observing starte clouds covered the whole sky. I had to squeeze through traffic to get an opportunity to sketch, only to find the sky covered with clouds. At 8:45 the clouds melted to show Mars amidst a hazy moonless sky. At moments of fine seeing more details are revealed than yesterday's sketch. 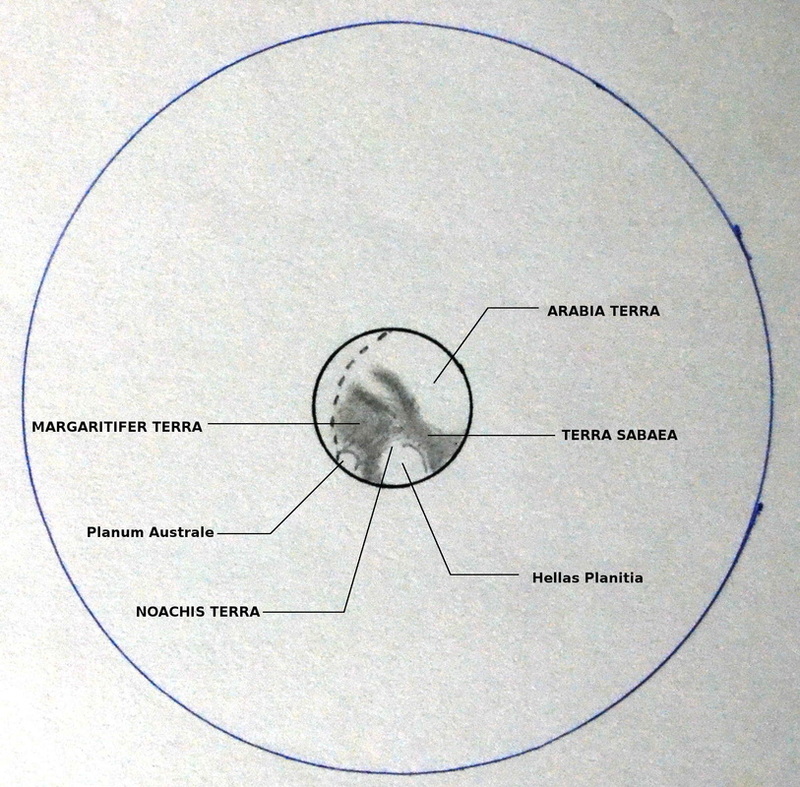 The lower part of the sketch shows dark portions for the first time. 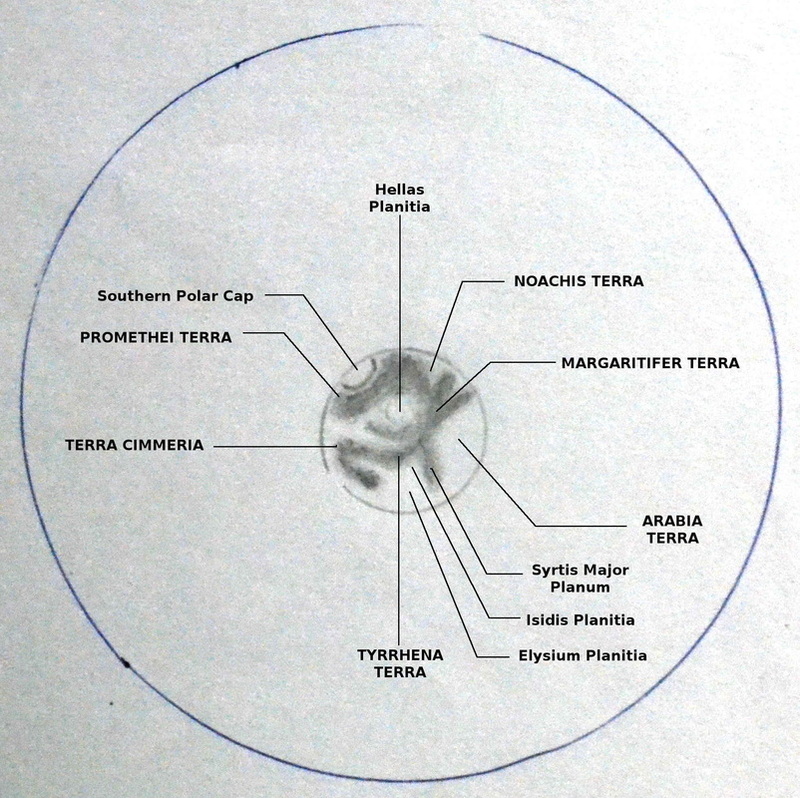 Martian features seen in this sketch and image include the Olympus Mons Region (center-left), Hesperia Planum Region (right), and the Hellas Planitia Region (top-left). Rained hard in the afternoon. Haze formed alternating between slightly hazy and very hazy. Mars shows new features I have not seen before. 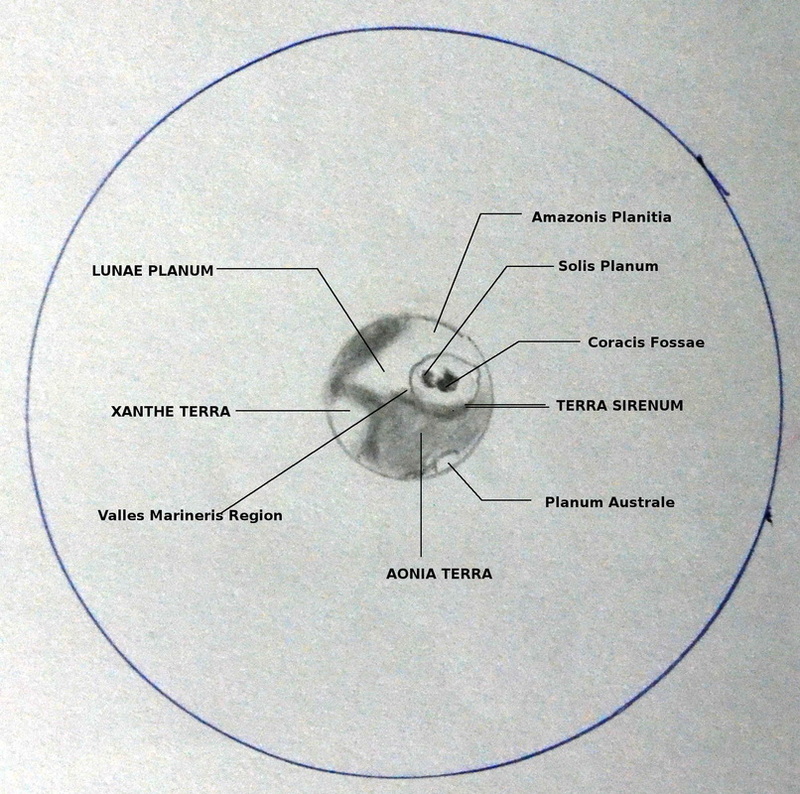 Martian features seen in this sketch and image include the Olympus Mons Region, Hesperia Planum Region, the Hellas Planitia Region, and the Terra Sirenum Region. 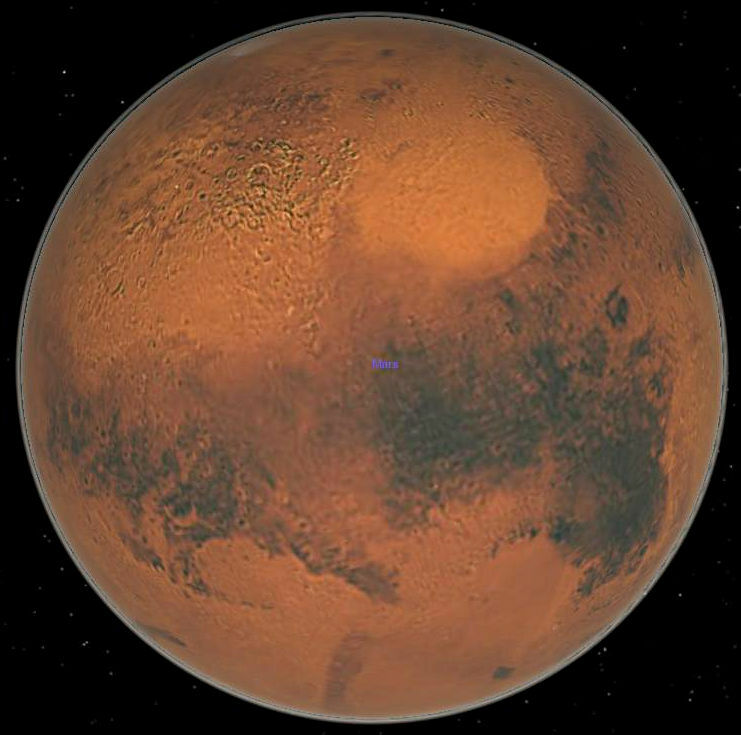 Mars seems to be obscured by something. There is no haze at 8:30 PM but I could barely detect any features on it except as may be seen on the sketch. Perhaps there is a dust storm in Mars. 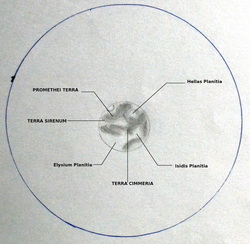 Only the Terra Cimmeria and Terra Sirenum are the regions visible from the sketch. 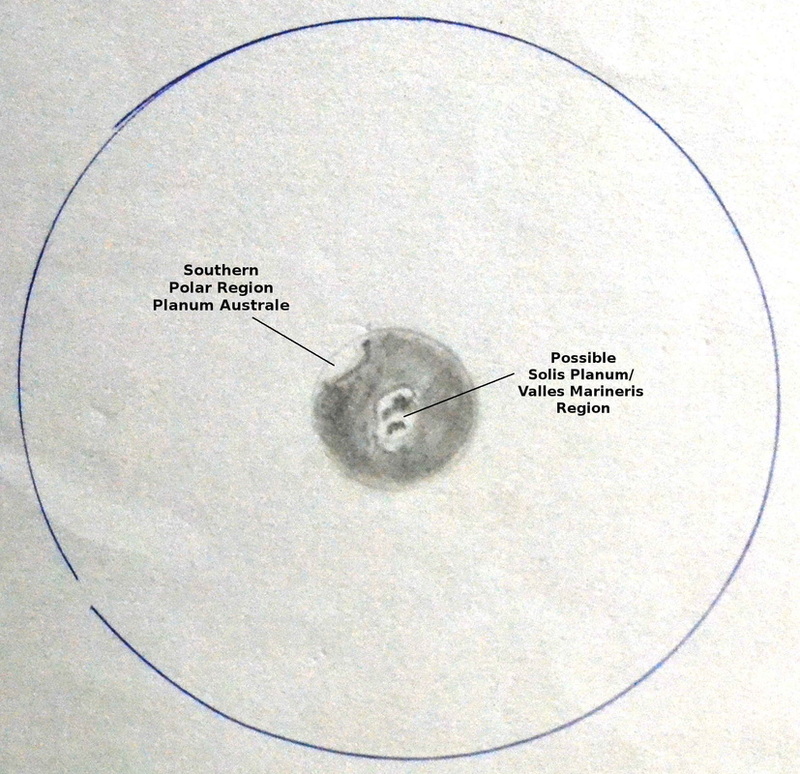 The upper region of the sketch that is obscured is the Olympus Mons Region. 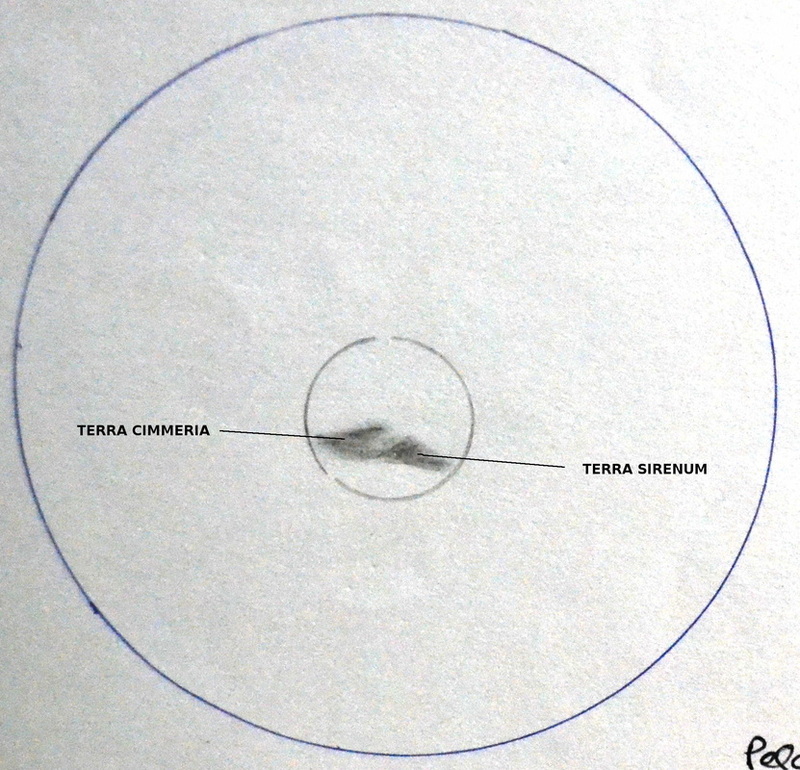 The Terra Cimmeria (left) and Terra Sirenum (right) regions are the dark areas prominent in the sketch. 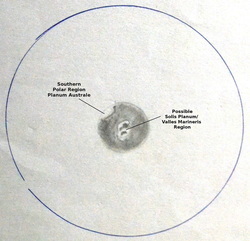 The upper region of the sketch and the image is the Olympus Mons Region. 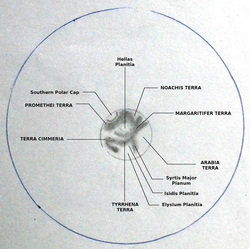 The area above that was sketched as a polar cap may have been a cloud with high albedo. Very hazy when I was making this sketch. Moon about 12.5 degrees to the Northeast of Mars. It still shows a lot of features. 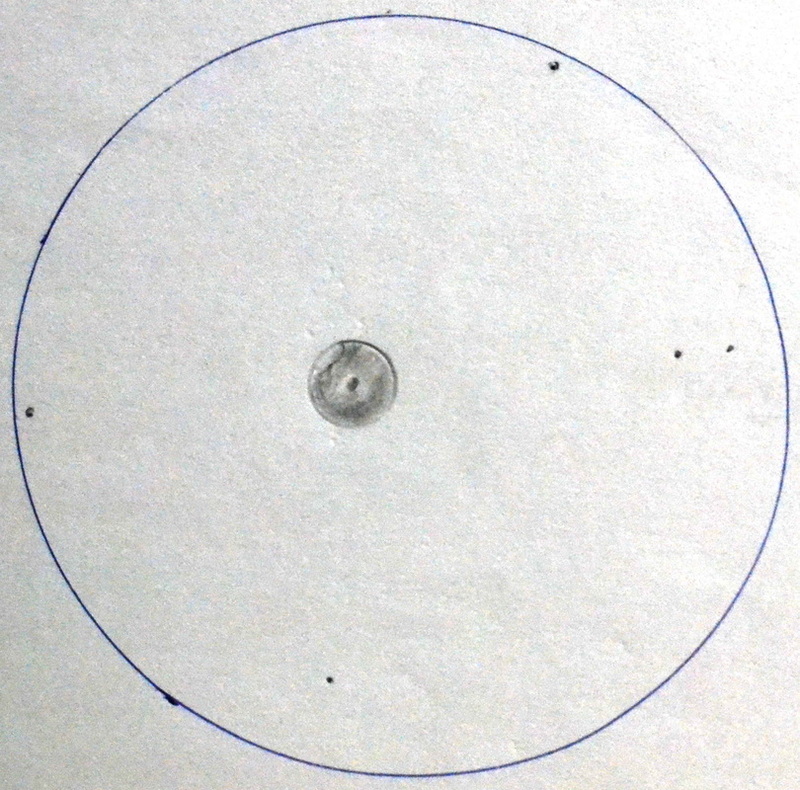 The sketch appears inverted from left to right in comparison to the image. 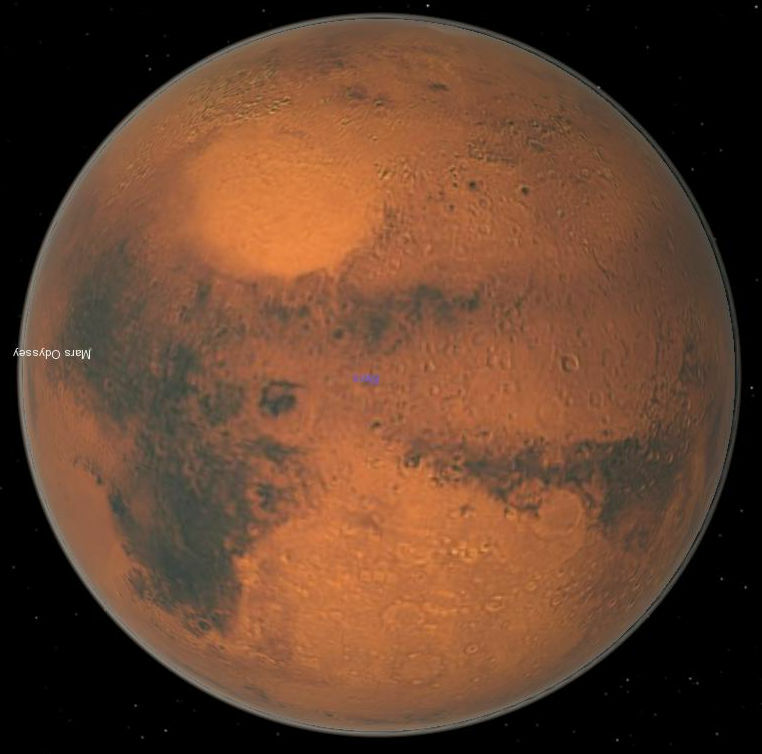 The wide blank area is the Olympus Mons Region, and next to it is the Valles Marineris Region. 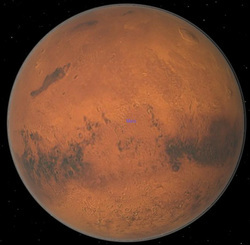 The area outlined in the ellipse is actually enclosed by the Valles Marineris and an outlying dark region along the border of the Aonia Terra in the Argyre Planitia Region (bottom right). 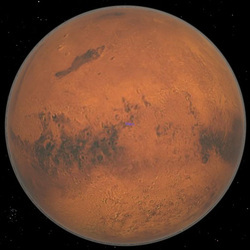 Mars is in a gibbous phase with the shadow falling along the Xanthe Terra region. 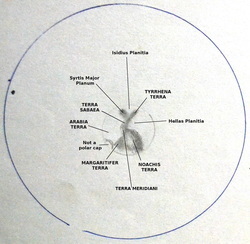 The large area in the upper right of the image is the Arabia Terra. 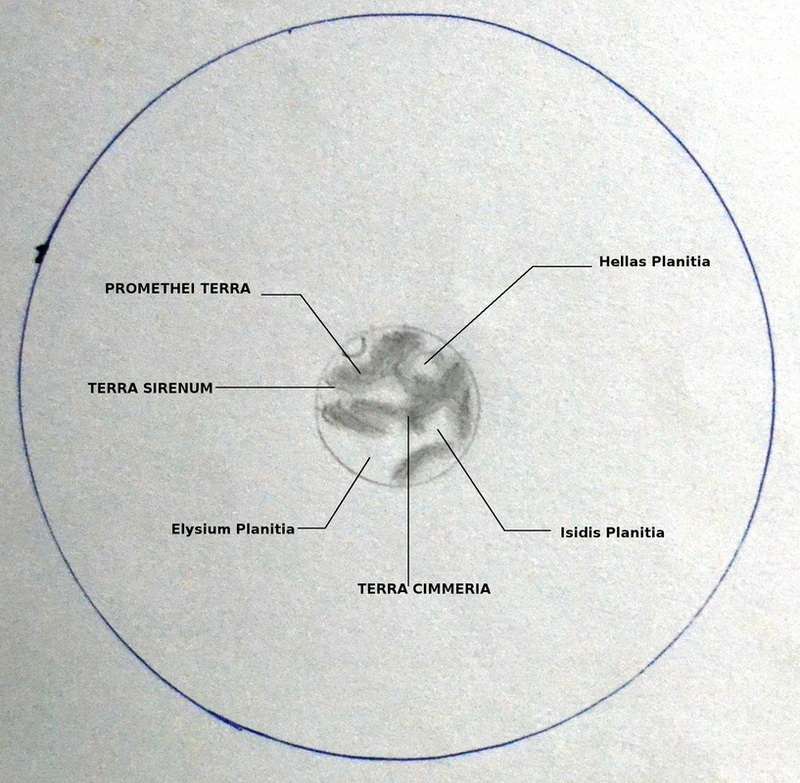 The large round area in the bottom of the sketch is the Hellas Planitia.